I like to have something special to read over the Christmas holiday. I think it makes the insular feeling all the more tangible to have a special book to look forward to and then devour. This year I didn’t have one. Oh, I had some reading lined up – I always need that – but I didn’t have the book that I thought might once again help to define my Christmas for me… yes, it is sad, I know. These seasonal reads don’t have to be festive or jolly or anything like that. Quite the opposite, in fact. A few years back, I had ‘In The Forest’ by Edna O’Brien, which may well be the bleakest book ever written. It was quite reviled in certain circles, here in Ireland, because it recounted a real-life murder and did so in great emotional and physical detail. Then there was ‘I’m Not Scared’ by Niccolo Ammaniti. What a great Christmas treat that was! Have you read it? You really should. It’s about a boy who finds a similarly-aged boy trapped in a pit deep in the Italian countryside. I will say no more than that, lest I spoil it. There was a film too, which was good, but the book is a complete joy. So here was I, this year, without a reserved seasonal read. I was re-reading ‘The Old Man and the Sea’ and loving it all over again but that was only going to take and hour or two anyway. What to do? Then we went round to our friend’s house on Christmas Eve, as we traditionally do, and she had four books on her table. She suggested that I take one and read it and tell her if it was any good. It seemed like fate, perhaps it was. They were four slim attractive volumes. I picked one, I can’t remember what the other three were, sorry. So, having read it, I now wish to wholeheartedly recommend my 2009 Christmas read to you. Pietro Grossi is a young writer who claims Hemingway and Salinger as influences. This is not hard to see. Maybe my perception was a little heightened by finishing ‘Old Man and the Sea’ at the same time, but Grossi writes most convincingly of the sporting challenge and the condition of being a Man. He also writes with that sparse, razor style that I admire so much in the writers who have influenced him. The book is made up of three long short stories (too short to be classed as novellas). The first and best concerns boxing and gives one of the best accounts of a boxing match that I have ever read. The second deals with horses and the third and least convincing is about the friend of a man who believes he is a monkey. I really enjoyed this book. The writer is confident enough to get out of his stories when he feels his work with them is done – even if we, the readers, might not fully agree. He writes like a man who knows what he is writing about – a man who has stood in the ring, a man who has healed horses. I believe him in what he writes. So once again this year, I have had my holiday read. 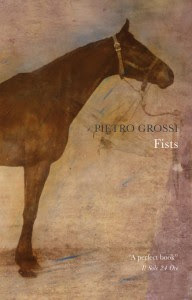 “Christmas 2009” will be partially defined for me by Pietro Grossi and his great little book. Post Script: Jim Murdoch reviewed this book some time ago. I would have read his review at the time. I must have forgotten about it... or did I? Read it here and note the Author's reply in the comments. Carries some literary weight, does 'Oor Jim'. Sorry James! I must have read that at the time. I think you subliminally influenced me there. Impressed to see the writer come and comment on your review too. Excellent work. I have not read the book you recommend ,nor read Jim's post, but I can recommend, 'I'm not Scared.' I'll look into Grossi's book. I like the idea of having Christmas balanced by a fantastic and disturbing book. Have you considered the book by Australian, Kate Grenville, called Dark Places. That might be one for this year's Christmas. It's sure to unsettle you, and not in a bad way. Glad you found a good one for 2009, too. Elisabeth: I shall go and have a look at that with interest. Thanks. Susan: I *know* - all those movies to be watched. We finally caught up with Star Trek and loved it a lot. Have you seen District 9? Not kiddie material but a clever and well-wrought twist on the alien visitor story. I remembered a couple more of those Christmas reads - 2 years ago it was Laurence Block's Collected Short Stories called 'Enough Rope' and the year before that was 'Deep Water' by Koji Suzuki (he of 'The Ring' fame). I understand your sadness: I, too, try to have a book that defines Christmas for that year. I tend to dip into it over the Christmas, to savour it and enjoy the anticipation of reading it in the new year. Have yourself a great New Year. I really hated Old Man and the Sea, but I read it many moons ago in 8th grade English, lol. I read several over the holidays that I liked. One was The Case of Jennie Brice. It's an oldie! Set in early 1900's Pittsburgh. I will look into the others. You steered me right on the Girl with the Dragon Tattoo.